Muzecast - Stream music from Home Computer to Android phone or tablet. 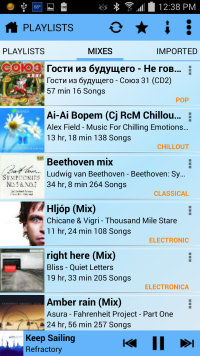 Muzecast is a secure music streamer for any Android device. Muzecast streams music from your Computer to any Android device over the Internet (Wi-Fi, 2G, 3G, 4G, and LTE). Hi-Ref files support - Supports streaming Hi-Res files, such as SACD, DSF 128 (DSF, DFF), FLAC, APE, WavPack up to 192Khz 24 bit. 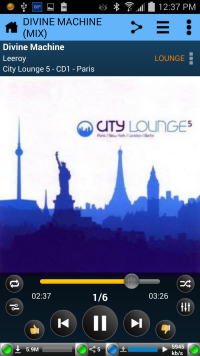 Have you used Pandora radio? Do you like dynamic playlists? Muzecast has it. Dynamic Playlist Generator. Enjoy endless dynamic auto growing playlists generated based on or similar to an Artist, Album, or a single song you picked or listening. 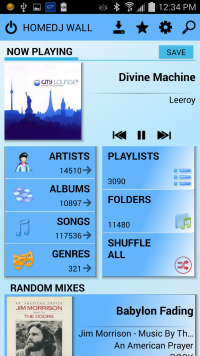 Just pick a song you want and select "Create Mix". Muzecast will do the rest and will keep adding songs to the MIX similar to one you picked or the one just played. To make your device to stream any type of music file, Muzecast will convert these formats into your device compatible format, such as MP3, OGG, or even FLAC. If you have Disk Images with CUE sheets, Muzecast will automatically use CUE sheets to extract song from Disk image on a fly, so you do not have to split it every time you create or buy a disk image with CUE sheet. No firewall configuration is required. 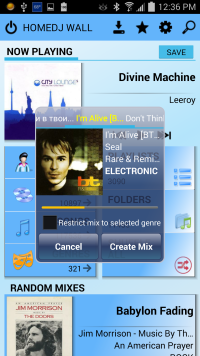 Download Muzecast Desktop Streaming Server here. To make access to your library secured, you would have to create user name and password once you install Muzecast Streaming Server on your home computer. Registration information will help Muzecast installed on your Android device locate your computer on Internet. All components of Muzecast Streaming platform are developed by the VORLAN Group, Inc. located in Feasterville, Pennsylvania USA. If you have any issues with Muzecast, questions, suggestion, or just want to say "thanks", please do not hesitate to contact Muzecast Support or please use Muzecast Forum. We would appreciate your positive Muzecast ratings and comments, as well as we would like to hear about any issues with Muzecast, so we can continue to improve it. I would like to thank Double-J Design for letting me use their images in application.